The same principle applies when using stencils for quilting, the aim is to get a neat finish. 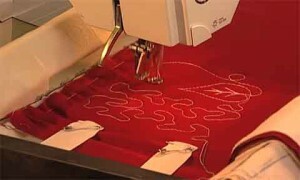 A quilting stencil is used to trace designs onto a quilt top and there are thousands of different design templates. 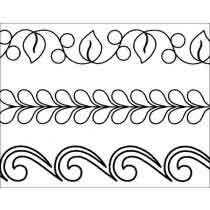 Grooves are cut into the templates forming patterns and designs, these guide you when you come to quilting your project. There are some quilters who have the knack of getting their designs onto a quilt top without the use of a stencil, like John Flynn, it’s fascinating watching him! It takes many hours of practice to be able to do this and some people (like me) never get the hang of quilting without a stencil. You can use a quilting stencil in many different ways. To fill in a negative space. Add a focal piece like on a medallion. Edge to edge design over the whole quilt. Once you’ve traced the pattern onto your quilt you can either hand or machine stitch the design. 1. A stencil of your choice, you can either buy ready-made stencils or design your own. EZ washout pencils which you can get in different colors. try the different colors to see which shows up the best, They wash out of most fabrics but check the labels to make sure. Air soluble marker/pens, the marks disappear without washing. Fabric mechanical pencils which have an eraser on them for removing excess lines. Chalk, tailors chalk works well but it can be brushed away to easily. The Quilt pounce is the fastest way to get your designs onto the quilt. The tool is filled with chalk and you literally “pounce” and swipe across the fabric to transfer the design. 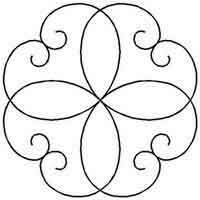 It’s more cost effective in the long term to learn to make your own quilting stencil. The designs you can create are endless and it’s fairly simple to do. You print or draw your design, place the plastic sheet on top (tape it down) and mark it with your chosen tool. There are different methods of making your own stencil. 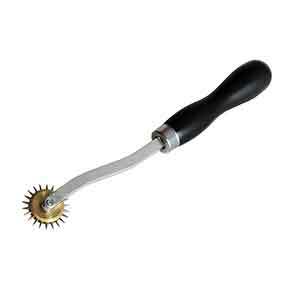 You can use an unthreaded sewing machine, a tailor’s wheel, or a heat tool. 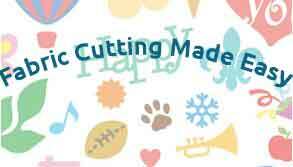 I found an excellent article that explains how to make your own plastic quilting stencils here. Some quilters will mark the stencil before basting the fabric layers together and some prefer to have the basting done first. Decide where you want the pattern to start. Generally quilters prefer to start in the center and work out from there. Lay the stencil on the quilt and mark with your marking tool of choice. Lift and reposition as necessary, work your way around the quilt in this way. Remember not to press too hard so your quilt isn’t stretched and the pattern looks distorted. I’ll leave you with the following video from The National Quilters Circle. It goes through the whole process of using stencils for quilting and the tools used. Enjoy! I do admire the work of others though. It is amazing to me the skill and patience that goes into quilting. Thanks for sharing. Found ya in twitter so, I thought I stop by and look around. Not sure I’ll pick up quilting anytime soon, But play a tune on the guitar. Thanks for leaving a comment Larry and never say never, many men have taken up quilting and it’s becoming more popular! Very nice site, Kathy. Very well structured…nice content…and you included a video! Thanks for another great article full of useful tips for quilting.